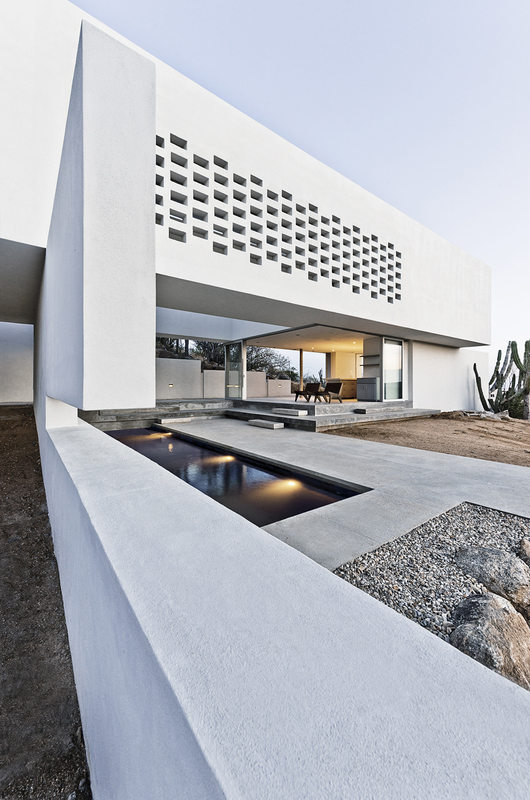 This project is an exploration of the modernist pavilion in an extreme desert climate. The site is a west-facing rocky knoll with distant views of a volcanic mountain ridge to the West and the Sea of Cortez to the South. The organization of the architectural program is used to create a passive solar response to the constraints of a challenging site and modest construction budget. The design strategy works with a small building footprint on the steeply sloping site – organizing the public living areas on a series of cascading platforms, shaded and sheltered by a single monolithic rectangular volume that houses the bedrooms above. The circulation corridor on the upper floor features a southwest-facing perforated exterior wall that absorbs the intense solar gain, isolating the inboard bedrooms from the heat while also creating a pressure differential that results in effective passive ventilation.